MELBOURNE, MONDAY 3 AUGUST, 2015: Eight universities in Victoria and NSW have entered into a partnership with APR.Intern to boost industry-academic collaborations and improve the work-readiness of Australian postgraduate students. The partnership looks set to deliver the federal government’s current agenda on the commercialisation of publicly funded research with every internship creating a collaboration between academia and industry – ensuring a work-ready PhD student and a significant outcome for the industry partner. Placing over 130 postgraduate students into industry — across all study disciplines and business sectors — APR.Intern is Australia’s leading PhD internship program, delivering research solutions for challenges facing business. The student receives a stipend and is supported by an academic mentor throughout the 4-5 month project. Meanwhile, industry is reaping the benefits responding with a 97 per cent business satisfaction rating. The Victorian cluster includes the University of Melbourne, Monash University, Deakin University, Swinburne University, La Trobe University and RMIT University. And, in the NSW cluster the University of Sydney and University of Technology, Sydney. “The strategic partnership will enable APR.Intern to greatly expand. By embedding business development officers within these Victorian and NSW universities we will develop a wider range of industry connections for the benefit of our PhD students,” says Dr Hannah Hartig, National Program Manager, APR.Intern. Further expansion into other Australian states and territories is planned for 2016 and 2017. “APR.Intern provides the match-making so often needed in industry-academic collaborations and our solutions to sore points, such as intellectual property rights, are popular with industry partners,” says Dr Hartig. “We must increase the penetration of Australian graduates with advanced research expertise into the private sector. They will boost innovation and business-university collaboration but we must give them those skills. And give business the confidence to employ them,” says Professor Geoff Prince, AMSI Director. This co-investment partnership is timely given the National Strategy for Work Integrated Learning led by the Australian Collaborative Education Network (ACEN). There are few industry-based work-integrated learning opportunities for PhD students, especially those cohorts not associated with industry-supported initiatives such as Cooperative Research Centres or Industrial Transformation Training Centres. 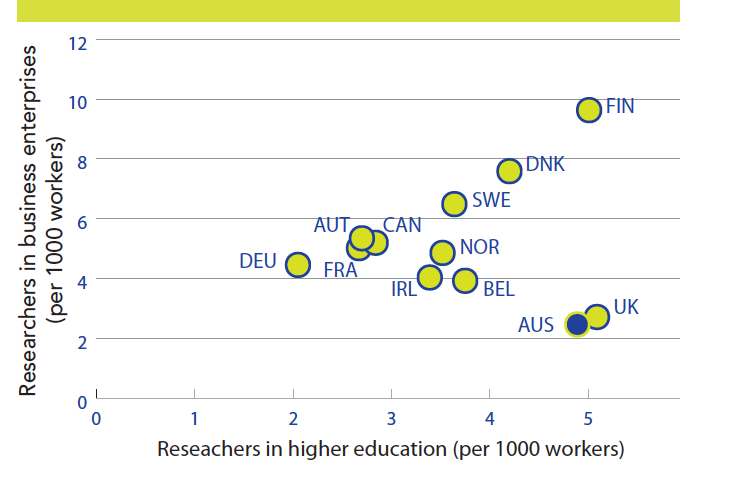 OECD scorecard shows that out of the developed countries Australia has one of the lowest numbers of researchers in business – 2.2 researchers are employed in business for every 1000 workers. The proportion in the smaller countries of Sweden, Denmark and Finland are more than three times that of Australia. SOURCE: Office of the Chief Scientist, Occasional Paper Series 2012 — Alan G. Pettigrew ‘AUSTRALIA’S POSITION IN THE WORLD OF SCIENCE, TECHNOLOGY & INNOVATION’. Less than one in two Australia firms identify themselves as innovators. And only 4 per cent of our large firms collaborate with higher education and research agencies – that ranks us at 33 (out of 33) in the OECD. For Australian SMEs we rank equal with Brazil at 32. SOURCE: OECD, based on Eurostat (CIS-2010) and national data sources, June 2013. Government Discussion Paper ‘Boosting the Commercial Returns from Research,’ October 2014. Australian Technology Network of Universities (ATN) PwC Report ‘Innovate and Prosper – Ensuring Australia’s Future Competitiveness through University-Industry Collaboration,’ March 2015.